Does your entertainment system have wooden doors, or would you like to mount your components in a closet? Without a clear line of sight infrared (IR) signals from a remote control will not reach the equipment. We have the answer. 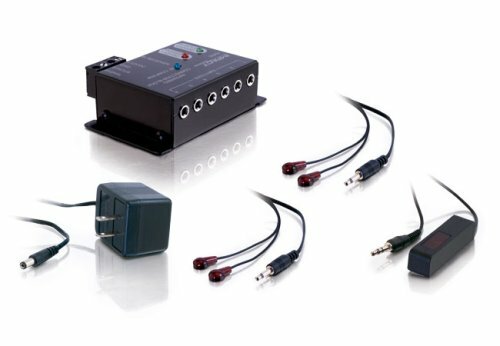 Our remote control repeater kit contains all equipment necessary to remotely operate 4 components (expandable to 12 components) using your standard remotes. Mount the IR receiver in a central location and connect to the IR distribution block. This block repeats the signals through emitters to your electronic components. Your components may now be mounted in your entertainment center, closet or another room! The kit is self-contained and easy to connect. With this kit, you may mount a receiver in a convenient place on or near your entertainment system. The receiver has a 9 foot cable that is then attached to the repeater system that is mounted in your entertainment cabinet. The kit includes 4 emitters. These emitters are connected from the repeater system and placed over the IR receiver of the equipment. The IR receiver and IR repeater have blinking blue LEDs to confirm receipt of the IR signal; the IR repeater is designed for mounting on shelf or wall. You can use your existing remotes for simple installation and hookups. Packaged for resale.